< img> The Timberland Pro series came up with the Pitboss Steel-Toe Boot that provides both safety and comfort on jobs that require additional protection. Whether you’re pounding the pavement in road construction or erecting high-rise buildings, these work boots can stand up to the challenge. 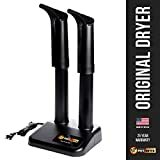 BootRatings has listed these boots as one of the best work boots available, and because of this we want to investigate further and inform you of the certain features and technology available in these work boots, plus we will rate them for comfort, safety, and price. 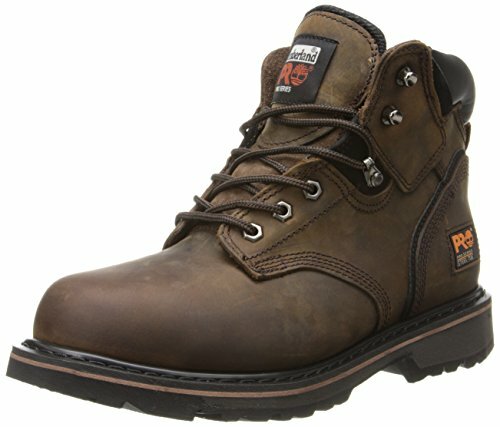 Pitboss work boots do come with a steel toe that meets ANSI safety standards, plus they also feature a roomier toe box for a more comfortable fit. In addition, they also provide electrical hazard protection against shocks. In addition to the steel toe, they also have a slip, oil, and abrasion resistant outsole that also offers electrical hazard protection which is essential for someone who works around open circuits such as an electrician or HVAC technician. Furthermore, ample traction to grip slippery surfaces keeps you on your feet where you need to be. These boots have a 24/7 comfort suspension system incorporated in their manufacturing which reduces foot fatigue. Also, a removable sock liner and padded collar guards against rubbing that can produce raw areas and blistering. A contoured shock diffusion plate disperses the pressure from impact and helps to stabilize and support the foot. The liner is breathable and is treated with an antimicrobial application to prevent odors. Timberland manufactured these boots with durability in mind. Goodyear welt construction provides a lasting chemical bond that connects the outsole to the Nubian leather boot. Metal hooks and hardware adorn the sturdy lace-up boots. In addition, polyurethane midsoles and Pro rubber outsole provide durable comfort. These particular work boots are not waterproof and it is suggested prior to wearing that you apply a water resistant application to maintain leather quality. Find out how to waterproof and care for your boots here, or check our top waterproof boots list. As a rugged work boot with additional safety features, they are typically used in hard labor environments such as construction, auto shops, and road construction. They are also a nice choice for someone who has to do a lot of standing or walking on concrete. Check out our best work boots for construction here. It’s possible that you might have to purchase additional insoles for more comfort. The metal rings and hardware on boots have a tendency to pinch if you don’t wear tall socks. The lining in the heel of the boot tends to wear faster than the rest. This can be prevented by making sure you have the appropriate size boot for your foot, and also wearing a thicker pair of socks will help. The Timberland Pitboss work boots are constructed with Nubuck leather, polyurethane midsole, Cambrelle fabric lining, nylon shock diffusion plate, and a heat resistant rubber.